CorelDRAW – professional graphic design software for vector illustration, layout, and so much more. Get started quickly and easily with a wealth of intuitive tools, built-in learning materials, sample files and project templates. Vector Illustration: Use powerful vector illustration tools turn basic lines and shapes into complex works of art. Page Layout: Find all the tools you need to create layouts for brochures, newsletters, multi-page documents and more. Typography: Arrange type beautifully with a complete set of typography tools. Adjust font, size, leading and kerning, and add effects to text like block shadows and contours. 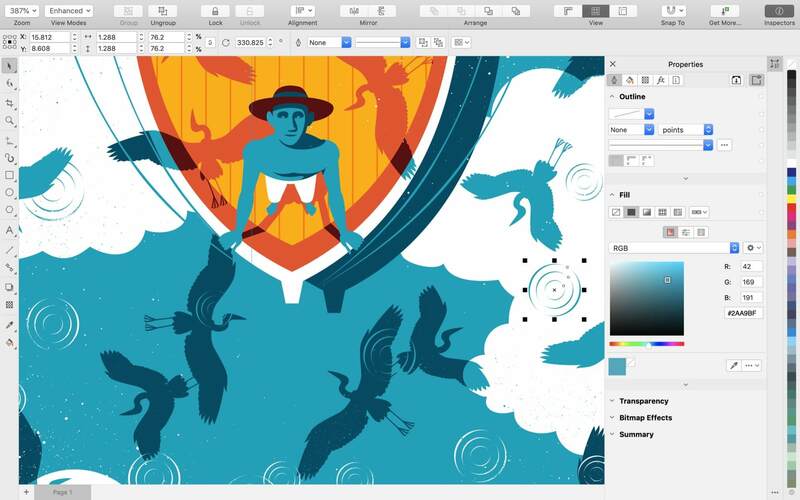 Color & Transparency: Easily apply color to both fills and outlines. Change the transparency of an object, and fill objects with patterns, gradients, and mesh fills, and more. Styles: Manage styles and style sets to apply consistent formatting across multiple objects, produce iterative versions, and format whole documents quickly and consistently. Tracing: Save precious time while converting bitmap images into vectors. The built-in Corel® PowerTRACE™ engine turns the most demanding bitmap images into high-quality vector objects. Non-Destructive Editing: Edit bitmaps and vectors knowing you won’t harm original image or object. Enjoy many non-destructive features such as Block Shadow tool, Symmetry Drawing mode, Impact tool, and more. Web Graphics Tools: Develop captivating web content and graphics with a collection of web graphics tools and presets. Professional Print Output: With a powerful color management engine, you can control color consistency across different media and know your colors are accurate before you print. File Compatibility: Publish to a wide variety of file formats, including AI, PSD, PDF, JPG, PNG, SVG, DWG, DXF, EPS, TIFF and more.